Gather your hard boiled eggs, craft supplies and imagination -- it's time to color Easter eggs. 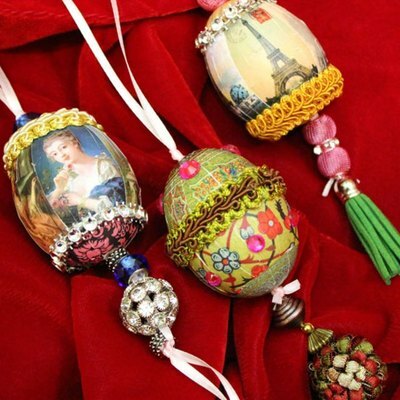 These creative projects will most certainly brighten up your Easter basket. 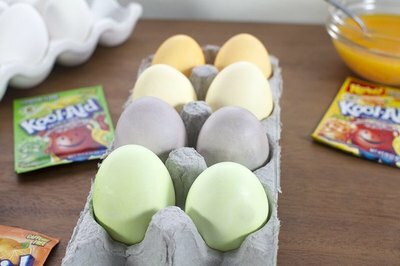 Most egg decorating techniques require a base dye, but its easy to color them too lightly and end up with barely any color at all. This simple how-to results in beautiful, rich colors that make the perfect starting point for creativity, or are pretty enough to stand on their own. You'll get different results depending on whether you use brown or white eggs. Use a few of each for variety. 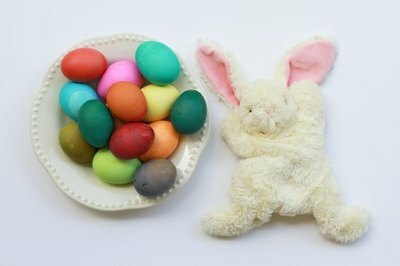 These vividly colored eggs are a perfect project for older kids to tackle on their own, or team up with younger siblings for a group effort. Primary colors work together to create a variety of different combinations and shades. 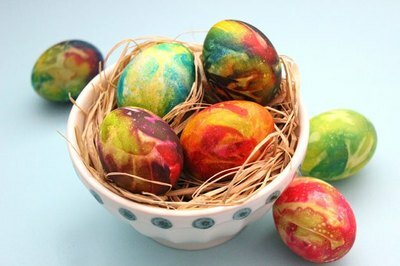 The tie-dye effect is so striking, you might want to make extra to showcase on your Easter table. If you want to skip commercial dye kits and go the natural route, a little hunting in your kitchen will result in enough ingredients to color eggs. This how-to uses coffee, blueberries, turmeric, paprika, and beets. You could also try leafy greens, tea, vegetables, and fruit peels among other things. 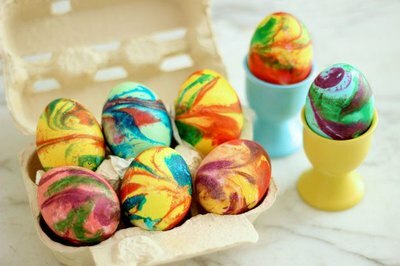 Eggs take on vibrant, colorful swirls by rolling them in a mixture of food coloring and shaving cream. 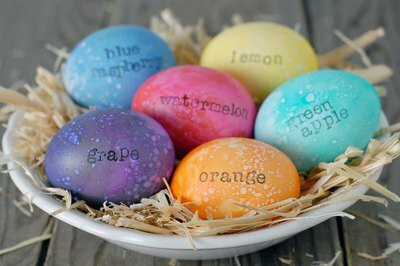 They look most colorful with a base color, but the colors would also stand out sharply if you leave the eggs white. If you’re doing this with kids, go ahead and leave the shaving cream out for playing after you do the eggs for a fun sensory activity. 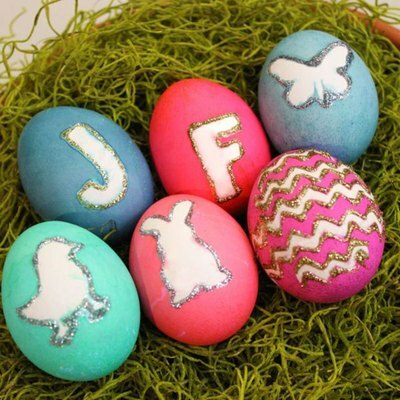 Adding a monogram or silhouette will take your egg game to a professional level. Best of all, they are not much more difficult than average egg decorating. Besides letters, you can make a design with any kind of sticker you want. Let your creativity run wild. Collect embellishments such as sequins, tassels, and laser printouts to create stunning decorations. 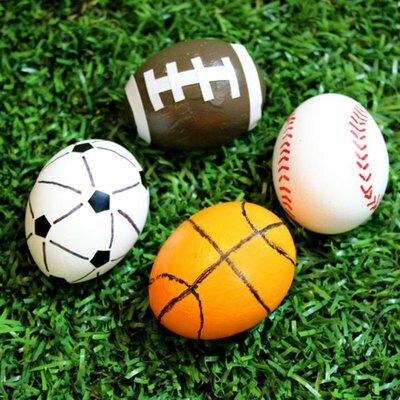 Since they require blowing out the eggs first, you can keep them beyond this year, but the fragility of the eggs probably means the kids should sit this one out. You can make little models of any ball using acrylic paint and permanent markers. If you have athletes or sports fanatics in your family, this idea will score big! Make it a multisensory experience by adding scents. If you use food safe flavor extracts such as lemon or orange for the scents, the eggs will still be edible. Do a basketful of one scent for a strong aroma, or mix and match for fun.